Neutrinos, ghost-like particles that rarely interact with matter, travel 450 miles straight through the earth from Fermilab in Illinois to Soudan, Minn., with no tunnel needed. The MINOS experiment studies the neutrino beam using two detectors: The near detector at Fermilab records the composition of the neutrino beam as it leaves and the far detector in Minnesota, a half a mile underground, again analyzes the neutrino beam. This allows scientists to directly study the oscillation of muon neutrinos into electron neutrinos or tau neutrinos. 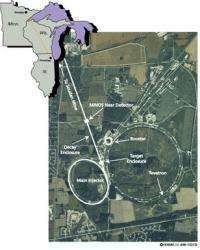 (PhysOrg.com) -- Two separate collaborations involving Indiana University scientists have reported new results suggesting unexpected differences between neutrinos and their antiparticle brethren. These results could set the stage for what one IU physicist calls a "radical modification of our understanding of particle physics." The two experiments -- MINOS and MiniBooNE -- in their own unique ways search for a phenomenon where one type, or flavor, of neutrino (there are three: electron, muon and tau) changes into another flavor while traveling through space. Previous experiments, including MINOS, have reported evidence for such transitions, the existence of which indirectly prove that the ghostly neutrinos have non-zero, albeit tiny, masses. In the MINOS (Main Injector Neutrino Oscillation Search) experiment a proton beam is sent to a carbon target, creating subatomic particles that decay into muon neutrinos and antineutrinos. The beam is sent 735 kilometers through solid earth, first through a near particle detector at Fermi National Accelerator Laboratory (Fermilab) in Batavia, Ill., and then through a 5,000-ton far particle detector in Minnesota. Scientists then measure the rates that muon neutrinos and antineutrinos convert, respectively, to tau neutrinos and antineutrinos. Providing critical contributions to the new result, and also one of the largest groups in the MINOS collaboration, is the Indiana University High Energy & Astroparticle Physics (HEAP) group led by IU faculty members Mark Messier, Stuart Mufson, Jon Urheim and James Musser. Urheim, an associate professor of physics, has served as one of the organizers of the working group responsible for the new measurement, providing scientific leadership during the early stage analysis; Musser, a professor of physics, has for years directed the development of the software algorithms used to convert data into physically meaningful quantities; Messier, a professor of physics, led early development of the MINOS neutrino beam model and with IU graduate and post-doctoral students has refined and improved the model over time; Mufson, an astronomy professor, is leading the analysis effort looking for violations in the expected independence of the laws governing neutrino behavior with respect to speed and direction, which might be related to the new result. The IU group, including research scientist Chuck Bower, also played key roles in the construction of MINOS. The Standard Model of particle physics holds that particle and antiparticle masses should be equal, with no discrepancy in masses inferred from the energy scale at which the conversion process from muon to tau occurs separately for neutrinos and antineutrinos. But MINOS scientists found that not to be the case: the new results indicate that neutrino and antineutrino masses differ by about 40 percent. "Interpreted as measurements of neutrino mass, the MINOS results give different values for neutrino and antineutrino masses," Urheim said. "Equivalence of particle and antiparticle masses is a fundamental underpinning of the well-tested Standard Model of particle physics. So, if the neutrino-antineutrino difference persists, it will necessitate a radical modification of our understanding of particle physics." At the same time the new differences in neutrino and antineutrino behavior were being announced last week by the MINOS team, the group of MiniBooNE (Mini Booster Neutrino Experiment) scientists that includes IU associate professor of physics Rex Tayloe found muon antineutrinos turning into electron antineutrinos at a higher rate than expected. With a second discrepancy in neutrino oscillation (flavor change) uncovered, IU scientists realized the momentum building toward a reworking of the long-held Standard Model of particle physics. "Both of these experiments indicate that neutrinos are behaving differently compared to the antineutrinos, and if either of these results hold up under further scrutiny, the implications are profound," said Tayloe, who works out of the IU Center for the Exploration of Energy and Matter (formerly the IU Cyclotron Facility). "It would likely help us to understand the imbalance of matter and anti-matter in the universe which, currently, defies explanation and is one of the 'holy grails' of current physics exploration." Counting the number of muon antineutrinos oscillating into electron antineutrinos over a half-kilometer distance at Fermilab, MiniBooNE scientists were able to confirm a result consistent with findings from the Liquid Scintillator Neutrino Detector experiment conducted in 1990 at Los Alamos National Laboratories that found electron antineutrinos appearing about 0.25 percent of the time. But Tayloe said excitement should remain contained until the new findings are confirmed over what could be several years of continued data collection and careful checks of alternate explanations. "Enthusiasm for these results is tempered somewhat by the realities of these very difficult experiments," he said. "The number of neutrinos/antineutrinos observed in both experiments is quite small, which means that each of these observed results could have happened by chance about 5 percent of the time even if neutrinos and anti-neutrinos behave the same. Further data collection will help to resolve this problem." Urheim said MINOS may only double its antineutrino data set over the next few years and so noted the importance of new detectors like the $278 million NOvA (NuMI Off-Axis Electron Neutrino Appearance) detector, with which IU is also heavily involved, coming on line to further compare neutrino oscillation events. The results of both experiments will be submitted for publication in upcoming editions of Physical Review Letters. The work is also expected to generate discussion among an international cast of scientists visiting IU Bloomington for the upcoming CPT and Lorentz Symmetry Conference, June 28-July 2, that is being hosted by the IU Physics Department and organized by IU distinguished professor of physics Alan Kostelecky. Ground was broken in 2000 and data collection began in 2003. IU is a charter member of the experiment, which involves more than 140 scientists, engineers, technical specialists and students from 30 institutions in five countries: Brazil, Greece, Poland, the United Kingdom and the U.S. Funding comes from the U.S. Department of Energy and the National Science Foundation in the U.S., the Science and Technology Facilities Council in the U.K., the University of Minnesota in the U.S.; the University of Athens in Greece, and Brazil's Foundation for Research Support of the State of São Paulo and National Council of Scientific and Technological Development. The project began in 1997, the first beam-induced neutrino events were detected in September 2002, and the first anti-neutrino events were detected in January 2006. The experiment includes more than 80 scientists from 18 institutions in the U.S. But Tayloe said excitement should remain contained until the new findings are confirmed over what could be several years of continued data collection and careful checks of alternate explanations. That's like telling a kid to relax the night before Christmas! 95 percent accuracy isnt very good. The 3 neutrino oscillations have different masses. They clearly state more study is needed, but there are two separate collaborations suggesting similar results, which correlate to an older (third) study (the LSND experiment). (paraphrasing) It may indeed turn out to be nothing, but if either of these results hold up under further scrutiny, the implications are truly profound. So when people read it on a science blog/website like this, suddenly it is 'real'..that science, which is all theory and never-ever been any sort of 'fact' (there is no such thing as a fact-which is the only fact that DOES exist!) may need an actual re-write! Ok. When the pioneer, who may see the need for a re-write of the THEORY and he/she may do this 50 years, heck, 100 YEARS ahead of the 'masses'.. does this somehow mean that ridicule is what should be engaged in, of that individual? Note that the herd instinct in the average man does color his thoughts to some degree so he/she does indulge in ridicule and dismissal. Here, in this tiny article and the associated comments and reactions, is a PRIME example of this animalistic phenomenon at work. So, in essence, it is almost never the theory or the work that is new that is the problem, it is the egoic function of the masses looking at the information that is at fault. I hope some of you can understand these VERY critical points. What will be found, is that the tiny 'mass' (motional vortex aspects) ends up equaling the fudge factor(s) that have been used and abused in just about every physical constant and calculation since the dawn of physics. The continual tiny near insignificant bits that they keep coming across that seem like measurement residuals or measurement/gear inaccuracies, but were really 'other dimensional' aspects of reality that keep poking through the skein. KBK - That herd mentality works both ways. There are some who follow the herd. There are others who gather in the distance. The herd is still the center. The basic precepts of science based in the scientific method is designed as much as possible to separate human ego/politics/opinion from measurable reality. Its trivial and common for an ego (yes I am talking about you KBK) to pontificate about the reality of some alternate physics. Lets see the math! Lets see some proposed experiments that could confirm it! Of course... that requires real effort and collaboration. I hope YOU can understand these very critical points. Particle physics do not require a "rewrite": It cannot be rewritten since it is NOT really physics. It should be discarded as a joke! The question is, why people are adhering on particle/antiparticle symmetry so much, if they know, every symmetry is broken in physics less or more later? Physicists know very well, what to expect & measure - these experiments are planned many years in advance. Charge parity has never been shown to be violated. In 1964, James Cronin, Val Fitch with coworkers provided clear evidence .. that CP symmetry could be broken, too, winning them the 1980 Nobel Prize. .. according to the Standard Model it contains 3 quarks. What if the B meson and its antiparticle were really made up of a combination several neutrons and/or protons as well as their antiparticles? All mesons contain only two quarks, it cannot contain neutrons or protons and therefore the rest of yours deductions is just a nonsense, which can explain anything. Out of interest: Have they split a meson into two quarks to prove this experimentally?